I'm *so* over the "this [item] is [superlative] and lets you [do something extreme that an angry man would do]" ad style. It's been done over and over for the past few years, and is rarely fresh. But, here's one more, courtesy of reader Dave. Enjoy. Do you like fire, and meat? Spring is upon us here in Ottawa; trees are budding, the birds are back, bees are chasing them trying to fornicate with them, and that only means that the time has come to fill the air with black smoke, and the heavenly aroma of searing meat! Having recently moved to a residence that does not have a natural gas hook-up for my backyard mistress (and being too cheap to have Enbridge to come out and set me up), I have no choice but to bid adieu to my smokin' hot Centro 5800 natural gas BBQ. My loss very well may be your gain however; and although It hurts my soul to see her go, taking with her 827sq in of white hot grilling surface (pretty sure you could fit a litter of kittens on her). I've already bought a sub-par propane BBQ that took 4 hours to put together, and takes an hour and a tank of fuel of warm up... So I suppose I should find a suitable home for the heavy lady of my past dreams and let someone else experience the joy Big Bertha has to offer. 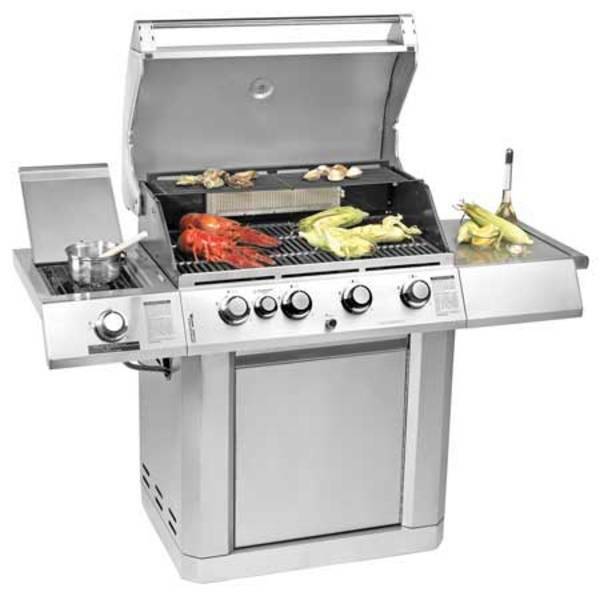 With 4 stainless steel tube burners u can control her with a simple flick of the wrist, and cranking out 80,800 BTU's she can flash grill a shark in under 6minutes! Having only been used for one season her porcelain coated cast iron grill racks look like the teeth on a west side rap star. Her stainless steel double wall roasting hood holds heat like eastside gangbangers at a Lil' John concert. Getting sweaty just reading this? It's all good this baby has a towel rack! Want to boil something while you grill but hate leaving the outdoors to tend to a stove like an employee at a catering depo? Use more fire on her 11,000 BTU side burner, and make that pot melt with desire. Oh yes, weighing in at 218lb Bertha is one sweet sweet piece... I miss her already. So if you want to be the envy of your street; and you mean business when you say you are going to grill, Shoot me a message drop 350 bucks or make me an offer and bring this b*** home.